Upon arrival in Milwaukee, Wisconsin, I rented a car from Alamo. We started heading towards Wrigley Field in Chicago, Illinois. Since we had some spare time, we decided to take a scenic route which enabled us to come across a nice local place to eat. We were driving along on US 41 & Illinois 21 aka Milwaukee Ave and we noticed a restaurant on the side of the road. The exact address is 1952 Skokie Highway in Gurnee, Illinois. It's not far from the Illinois/Wisconsin border. The King and our friend Jim Lowry were hungry and they wanted to have a hearty breakfast. 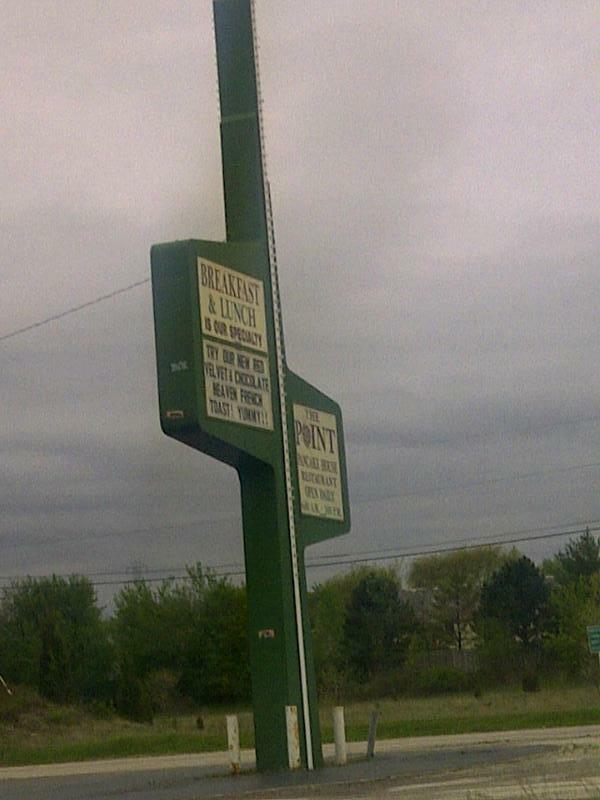 So I pulled into the parking lot and we went inside to eat to satify their needs and wants. Needless to say, we weren't disappointed. 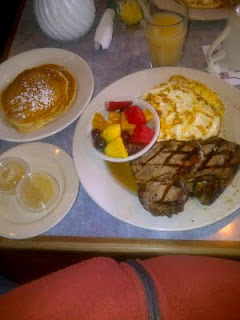 Please take notice of the picture of the pair of thick charbroiled pork chops, 2 eggs, 2 pancakes and fruit that I enjoyed during our visit to give you an idea of what it was like. If and when we're in that area again I know exactly where to go for breakfast or lunch since they're only opened 6AM-3PM 7 days a week. Feel free to follow the royalty recommendation. Yankee Doubleheader on Memorial Day! McCoy Stadium - Home of the Pawsox! The Royals & Royalty go to Fenway Park! Phillies go scoreless at Citi Field! Royalty returns to Fenway Park this weekend! Manual Scoreboard at Wrigley Field! Royalty attracts company at Wrigley! Old Time Vendor at Wrigley Field! The King makes it to the century mark at Wrigley! Royalty & Co. visit Wrigley Field! Manning Bowl 2 & more in the Midwest! Royalty takes in minor league experience!